Although this is rather out-of-date, I love the Wargames Factory Celtic Chariots. So very much. A plastic model that makes three Celtic chariots? Just wonderful. At this point, I have built enough WF Celts that I know what works with what, and what arms don’t fit, etc. I also replace all weapons with hammered wire. As a result, I have come to appreciate them more than I originally did. 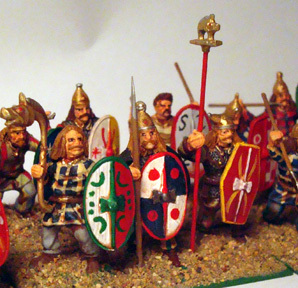 The figure mix on my units is also different because I have a lot of chariot crew figures mixed in – I used infantry figures on the chariots for variety. I have several other units of WF Celts, but to be honest, they all look much the same. The pictures below are my first WF Celts. I took a 32-man box and split it in two to make different troops, just to see. The first unit is a group of Caledones, a group living between the Picts and Britannia. 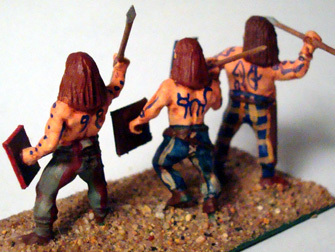 They have Pictish-styled shields and tattoos, but wear trousers. Their hair has been filled out with putty. The last group is Gauls or Britons. Like the troops above their hair has been filled out with putty.